It’ll blow his mind, if it fits his wee blond head. Cross your fingers for me that his noggin isn’t bigger than 19″ in circumference, okay? I have to say, this was fun. There may be another of these in my future, because Mr. Garter has been drooling over it. Time for more stash diving! 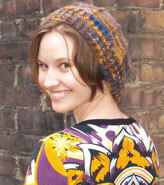 Note: The charts are free here; there’s really no other pattern for the hat. 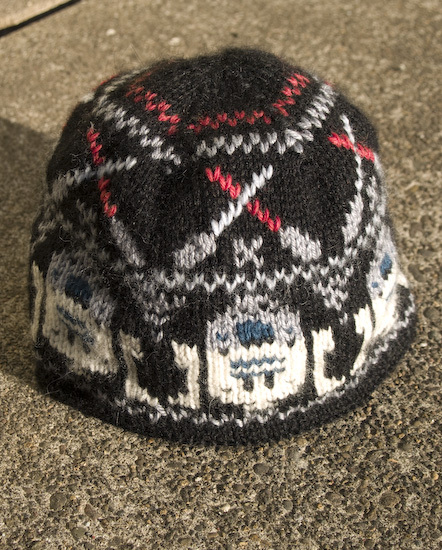 I worked it on US#3 needles, figured six repetitions of the chart would make a boy-sized hat, and threw in some double decreases at the top between motifs. I worked the letters under the brim upside-down, used a row of purl sts as a turning round, and sewed down the cast-on edge to the inside of the hat at the very end. Awesome. It’s so much fun to blow a 7 year old’s mind with the perfect handmade gift – helps set their priorities, y’know? Truly amazing! That would make any boy’s birthday, whether he’s 7, 17 or 37! J’adore le (la?) hat! What a lucky nephew! That is an awesome hat! I love it! What a lucky cousin. Fabulous! Now that’s a great reason to have a yarn stash. Awesome hat! You just created this little pattern as you went along?? Fabulous. Lucky kid! Can’t believe that hat; it’s truly a work of art. Really puts stashing into perspective, huh? When you think of all the really bad things we could throw away our filthy lucre on, yarn seems pretty benign. How awesome! What is it about guys and Star Wars? My hubby wears the one I knit for him all the time! that just made my inner 12 year old squeeeeee! i liked it so much that i posted about the charts on the daily chum (www.limenviolet.com/blog) using your picture as illustration. and i gave you credit for the link and the pic. thanks! That’s awesome! I’m sure your nephew will love it. The “force” was with you on this one. Ms Garter and I don’t always see eye-to-eye about the yarn stash. I swear it is procreating when no one is looking and spewing out of closets like The Blob. Then again, Ms. Garter says the same thing about all the computers around the house. BUT I am now changing my tune for good, and it is in writing, less I forget. I covet this hat, and if Sam wasn’t such a great kid (plus I have a gigantic cranium), I would never let this hat out of my sight. Sam would never have known of its existence. 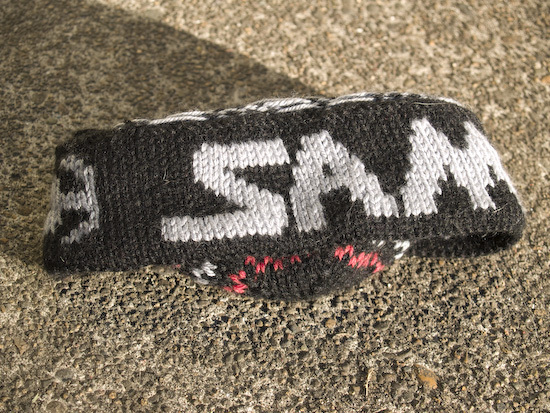 Ms. garter, can you add a picture of the TIE Advanced x1 Starfighter that you knitted next to Sam’s name? It is smoke’n. That hat is so cool! My husband (who never seems to be impressed with anything I knit anymore) happened to walk by the computer while I was reading this post and felt the need to comment to me on its coolness. what a great hat! I love that you added his name! Oh, he is going to love that! What great yarn stash improvisation as well. Great hat! A co-worker had actually stumbled across these charts a few weeks ago and I loved them! Nice to see a real project done with them and the name inside was a really nice touch! oh Sarah, you are so talented and clever and accomplished! Wow. Mr. Kninja sits beside me, and he looks and says, “Wow. Make us something like that, Kristen.” Apparently you’ve found a way to justify knitting to male nerds. The tone of slight annoyance in his voice was indicative of the fact that I never do anything useful with my sticks and string, like knit Star Wars motifs. wow! i’m totally impressed and blown away. a thoughtful, delightful gift. That’s nifty! I wouldn’t worry about the fit, but I have a pretty small head (a 19 inch hat fits me). My hubby would like one if he didn’t enjoy Hufflepuff so much more. How cool is that! Great hat.